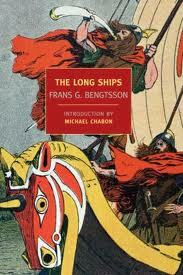 Chances are you have not read The Long Ships. It has been out of print here in the U.S. for several decades, and although it is a huge classic in Scandinavia it never had that big of a following here. Maybe because the old cover art was terrible. Maybe also, like me, you are not a Viking person. 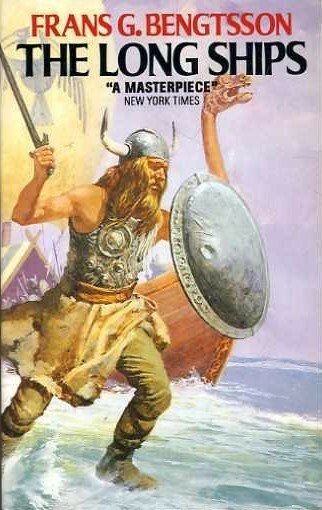 There are cultures and eras that captivate me; heretofore none of them have had anything to do with Vikings. I hate the cold and I hate boat travel and I do not love three letter names, especially when one or more of the letters is G. So the whole romance of the Vikings is not my cup of tea. But when pretty much every conversation about George R.R. Martin’s books last year included at least one person saying that The Long Ships is a must-read for anyone who likes historical fiction I figured I could at least give it a try. It took me awhile after buying it to be fully in the mood, but when I did dive in I plunged immediately into a warm, gurgly pool of five-star loveliness. What is it? Well, it is about Vikings–kind of. The best way I can describe it is to say that it is a combination of Ben Hur, The Thousand Nights and the One Night, and Bernard Cornwell’s Saxon Chronicles (which I didn’t enjoy so much but do cover the same time period), all told with the same type of wry humour that makes Twain and Kipling hands-down classics. It’s a story that you can picture a traveling bard relating to you as you curl up next to the fire with a cup of hot chocolate. It’s epic and focused at the same time. Huh. Now that I think about it, it does remind me–oddly enough–of Mama’s Bank Account, which is a favourite of mine. It has the same sort of patchwork design in that it tells a sweeping story by telling several smaller stories that build upon the characters and place like bricks in an edifice. Both are by Scandinavian authors and I suppose, at their root, both owe a structural debt to the Norse Eddas. All of that lit-major prattle aside, I assure that this is a wonderful book. It’s back in print and it’s also in e-book form and I think it would give you one delightful reading experience. Plus, the new version has a much better cover. OK, the copy I requested is at my library branch, waiting to be picked up…. Great post. I was checking constantly this weblog and I’m impressed! Very helpful information specifically the remaining section I maintain such info much. I used to be seeking this particular information for a long time. Thanks and best of luck.